A few weeks ago I ordered a very nice reprint of Spurgeon’s autobiography from Pilgrim Publications, Pasadena, CA. Along with the 4-volume set they included a copy of this book by Eric Hayden, pastor of Metropolitan Tabernacle from 1956 until 1962. We attended Metropolitan a couple of weeks ago on our Baptist History tour. The history of this great church casts the largest shadow on Baptist history in England. Before Spurgeon, this great church was pastored by men such as Benjamin Keach, John Gill, and John Rippon. After Spurgeon were other great men such as A.T. Pierson, A.C. Dixon, and W. Graham Scroggie. Until this year no one had pastored this church longer than Charles H. Spurgeon (38 years). Two weeks ago we heard Dr. Peter Masters preach in his 39th year at the Tabernacle. 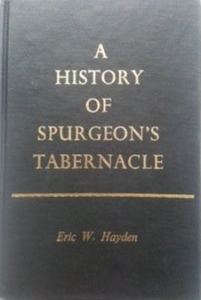 Hayden’s study of the history both of the church and also of its present building is comprehensive. He was also a personal friend of Dr. Martyn Lloyd-Jones who preached at Westminster Chapel for thirty years. The building that still stands at the famous intersection of Elephant and Castle in Southwark, London, has seen three phases. It was built in 1856 to accommodate the huge crowds that were coming to hear Spurgeon. The name was changed from New Park Street to Metropolitan Tabernacle at that time. It seated 6000 but 10,000 often attended. The rear of the Tabernacle was burned in 1898 when Thomas Spurgeon was the pastor and was rebuilt on a smaller scale. That Tabernacle lasted until the bombing of WWII when it was demolished except for the front portico. Its rebuilding was delayed until October 24, 1959 when, under Hayden’s pastorate, it was reopened for services. At that time it would seat about 1750. The front of the building is the same as in Spurgeon’s day but nothing behind it remains. Dr. Masters, a Reformed Baptist, still preaches the gospel to hundreds.